The Society Islands hold a central place in archaeological models of Central Eastern Polynesia colonization and social complexity, given their spatial importance as a gateway into CEP from the west. Archaeological fieldwork in the Societies has had a patchy distribution, with most recent studies largely focusing on the Classic Phase in the Windward Island group, disallowing regional syntheses. Inland and coastal Raiʻatea, (Leeward Society Islands) were excavated and dated in order to develop a local chronology. Analysis of artifact and faunal assemblages, in conjunction with settlement patterns, contextualize the Raiatean cultural chronology within the regional archipelago-wide cultural sequence. Finally, a suite of lab-based analyses (micro-fossil analysis, wood charcoal identifications, land snail identification) are used to tentatively model human-landscape interactions through time. With this new corpus of 14C dates, we now have evidence for coastal Raiatean sites dating to the late Expansion and the late Classic to Early Post-Contact phase. Data from inland sites indicate complex the construction of a sizeable ritual center, including several community level temple structures with notable architectural elaboration, in the late Classic Period. This correlates well with regional archipelago-wide settlement pattern shifts during the Classic Phase. Kahn, J. (2018) “Coastal and Inland Settlement on Raiʻatea (Society Islands) During the Development/Expansion, Classic, and Post-Contact Phases”, Journal of Pacific Archaeology, 9(1), pp. 25-43. 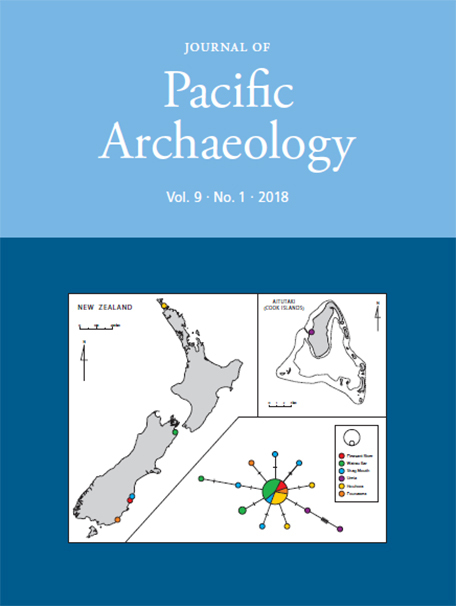 Available at: https://www.pacificarchaeology.org/index.php/journal/article/view/224 (Accessed: 22April2019).